Like it very much. Have to cross the snaps to make it fit just right. Looks very pretty when wearing it. 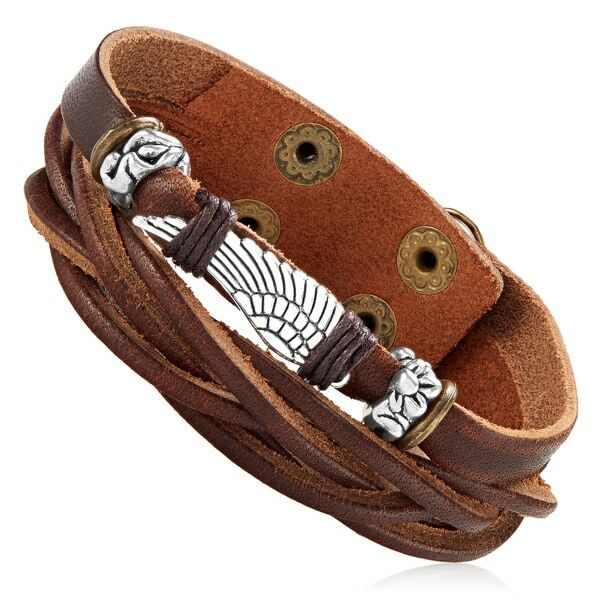 Keep up with the latest trends with this fashionable and stylish leather bracelet. This men's jewelry item features dual leather strands. One strand has a high polish silver tone angel wing charm wrapped to the leather strap with detailed metal beads on each end. The other strand is braided. The high polish silver tone angel wing charm contrasts well with the leather straps to create a fashionable and trendy accessory. This double strand leather bracelet is flexible and contours well onto the shape of your wrist for a comfortable wear. This bracelet is 22mm wide by 9mm thick, weighs 14.8 grams, and secures with a snap clasp. The snap clasp closure on this bracelet allows you to size the length at 7 or 7.5 inches. This was a gift and the recipient loved it. It’s not a wide cuff, slightly wider than a man’s leather watch strap. The wing detail adds a nice touch. Makes for a thoughtfully rich charm. A definite recommend. I got the black one it always stands out in a good way! Made from quality materials &amp; leather. Adjustable snaps on bottom. Nice leather bracelet, just a little too large for person I was buying for. My husband is very skeptical about buying items online because he is afraid that it will not look the same when you receive it. He is very happy with the look and quality of this band. My husband loves the bracelet, comfortable and easy to get on and off. I loved it. I loved the way it looked, and I loved the wing on it. It was comfortable to wear. I purchase it for a gift, and my nephew likes it.